Recently it has been becoming fashionable to use a crazy purple chimp on the computer. He says being an assistant for the internet, and he says trivia and jokes with a very funny little voice, but the truth is that it seems to have been taken from a trunk of memories. What is Bonzi Buddy really and why did it become fashionable? Why do some people claim that it is a virus while others say it can not do any harm? What happens if I install it on my computer? To solve all those doubts, we invite you to read this Brief History of BonziBuddy, the Internet’s Most Friendly Malware. As you thought, this little friend has been revived from the past by a group of idle programmers, but his real date of birth was in 1999, when he became extremely popular among a lot of Windows users who surfed Internet, to the point of becoming “viral”, but unlike today, that term was much more literal by then. The BonziBuddy software was good or bad? Maybe BonziBuddy never came to be really useful, but the truth is that at the beginning it was not bad either. When it was created, this online interactive software promised to help with all the tasks related to the internet: browse, search, e-mail, schedule and download, which at the time was a really attractive offer, as there was still a considerable number of people who did not efficiently handle all the features and tools of the internet. And why not trust a computer assistant? During the nineties, several virtual assistants had already been developed to guide and solve the doubts of novice users facing the use of computers and the Internet, such as Jane 128, Microsoft Bob, the Microsoft Agent group (Peedy, Merlin, Genie , and Robby), and the Office Assistant group (Clippy, The Dot, Hoverbot, The Genius, Office Logo, Mother Nature, Scribble, Power Pup and Will). In fact, BonziBuddy was initially created by the Bonzi company over the design of Peedy the Parrot, which was released by Microsoft so that it could be intervened by third parties. But like all his predecessors, who did not have great success in the field of technical assistance, BonziBuddy did not have it either. What made him really attractive before all the people of that time was his funny “personality”, which used spontaneous and constant interaction with the user through jokes, trivia, poems and riddles. This, in addition to being a free acquisition software, caused it to be downloaded by hundreds of people, who saw in Bonzi a kind of virtual friendship. 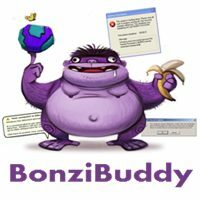 How did the BonziBuddy become a threat to computers? 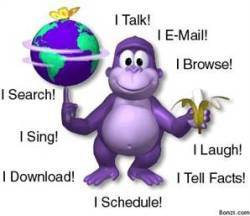 The BonziBuddy Software had a feature that made it difficult for the user to control: it was the first virtual assistant completely independent of Microsoft tools, or any other program. It was, in a certain way, autonomous, and by working with an internet connection, it was able to mutate in conjunction with any configuration and update that its programmers added to it. Thus, progressively Bonzi was acquiring more invasive, intrusive and even manipulative characteristics, which had as main purpose to suggest the user to buy other products from the Bonzi software developers, or paid features of the same BonziBuddy. It is not known if the programmers planned this turn since the creation of the assistant, or if they decided to give it when they realized that they could take advantage of its growing popularity to generate greater profits. The truth is that his striking purple monkey began to run so many abuses that it became little by little to a nightmare for all its users. How did BonziBuddy affect users? It threw false warning windows, almost identical to those of Windows, to make the user believe that he needed to protect his computer by buying Bonzi’s tools. It brought up Bonzi advertising pop-ups, which were not labeled as advertising, but appeared to be alternate functions of the program, and they also came with a fake “X” so that the person could not close the window in the traditional way. Registered and transmitted to its programmers the activity of the user’s computer without requesting their permission. Requested an online registration in which personal information was demanded such as the full names, age and address of the users. Changed the homepage of the browser to the Bonzi page, installed toolbars in your browser, among others. All these characteristics led him to be defined as a Malware, an Adware, and a Spyware, so it was discontinued in 2004, after its creators faced (and lost) a series of lawsuits in which they were charged for introducing subliminal advertising, for infringing the copyrights of Microsoft’s windows, and for collecting personal information from minors. Recently, in 2013, this friendly little monkey was dusted off by a Youtuber called Vinesauce Joel, who made several videos in which he destroyed his operating system congesting it with several old viruses, among which was Bonzi Buddy. In spite of this, since BonziBuddy was discontinued, it is no longer able to access the servers it requires to utilize its adware component, so it is now considered a benign software, or at best a Keylogger. Curious to know what it felt like to have a virtual assistant in the 2000s? Currently it is possible to get on the internet the Bonzi Buddy download to enjoy their jokes and their occurrences, without being a victim of constant harassment of advertising, much less the extraction of data from your system. They say that curiosity killed the cat, but in this case it is very unlikely, especially since the technologies have advanced enough so that this type of spyware is easily recognizable and exterminable by any antivirus. Even so, if you want to live the experience of this purple friend but do not want to leave any possibility of risk, we recommend the simple solution of using a virtual machine to keep it contained.